I finally got my seats back for the upholster. I am happy with the results. They match the back seats petty close considering the age difference . These are deluxe white comfort weave that I order the material is from SMS. They are the only ones that sell it that I know off. The old emblems where in bad shape so I replace them with ones made by Scott Drake. They where a petty good match. Looks fantastic! The difference between the real stuff and reproduction is very noticeable with the white interior! Did you use the original seat foam or repro? (06-29-2018, 12:49 AM)JD79 Wrote: Looks fantastic! The difference between the real stuff and reproduction is very noticeable with the white interior! Did you use the original seat foam or repro? They look great. I ordered a sample from SMS and it does look like a very close match. Back in the day, I was removing the comfort weave material from the rear seats of other 72 and 73 cars, since the rear seats were hardly used in our cars the material was in typically in great shape, and upholstering sections back into the worn out front seat bottoms and lower backs at the tuck and roll seams. It worked great. No need now with the availability of the SMS great reproduction. They look great. You will be much happier in the long run with the additional expense of the SMS material vs the repro. Hey they do not look like original not sewn crooked, lol. Some of my originals have to be 1/2" on angle for seams. SMS did buy the original looms to make the material so as long as they get the correct threads and colors it should match. They do look great just a white interior is hard to keep clean. I have two of them. Thanks. They used the old foam. The guy said it was in good shape. He also said they steam it to make come back in to shape. Not sure how that works but that the story. (06-29-2018, 10:10 AM)Carolina_Mountain_Mustangs Wrote: Hey they do not look like original not sewn crooked, lol. Some of my originals have to be 1/2" on angle for seams. SMS did buy the original looms to make the material so as long as they get the correct threads and colors it should match. David you right white is a nightmare to keep clean. But other than the photos of you 2 cars that have white comfort weave I have not seen it anywhere. That was the main reason I kept it. I think its pretty rare. I wonder if Ford tracked it. 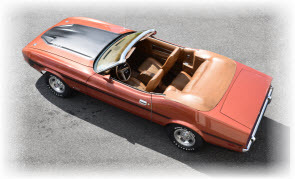 There were 1,315 2B Red 73 Convertibles produced with White Comfortweave CW Interiors and a little over 3,000 CWs in all colors. I once owned a 6C Medium Goldenrod 73 vert with White Comfortweave CW Interior. Only 23 of them made. and I can count those on one hand. You don't see a lot of convertibles around here. Just Mach ones.